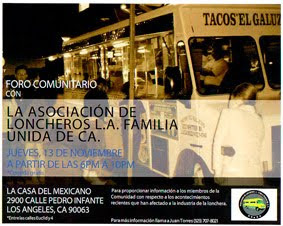 Tacos El Carnal is off the 10 freeway at the Alameda exit . You can’t miss it, it’s actually right next to the off ramp at a semi-truck fuel stop. It just so happens I came upon Tacos El Carnal by accident when I missed the San Pedro Exit off the 10. 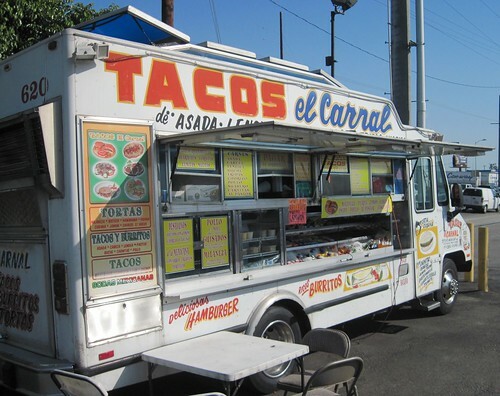 So here I was getting off at Alameda and there was Tacos El Carnal. It was like fate, if you believe in that, I don’t but it’s ok if you do. 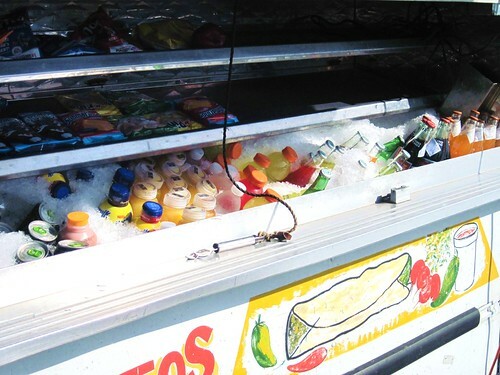 I’m always worried when I’m the only one at a taco truck. Is there something wrong with me or something wrong with them? Or I think , maybe I just missed the heavy lunch crowd, maybe they all just left happy and satisfied, leaving me, a desperate taco critic to ponder these questions. But then I think - well even if the tacos are bad it’s good to know anyway. It’s a good spot Tacos El Carnal has found. Right off the freeway, plenty of parking, lots of people coming and going from the big rigs. There’s an industrial feel to this side of town. It’s not quite the City of Commerce but it has the rumblings of machination. It’s where LA gets its hands dirty. The working class of the working class. I ordered two tacos (asada and al pastor) and a Mexican coke. It wasn’t long before I heard the sound of meat frying on the grill. Then others started to pull up ; a guy from a big rig waddled over, some workers in a pick up truck, some others by foot. It was the place to be. 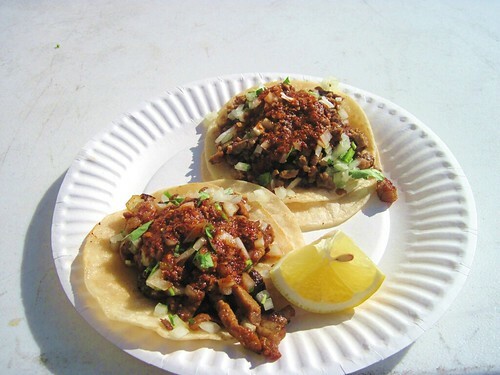 The menu at Tacos El Carnal doesn’t stop at tacos. They have cemitas, tortas, even enchiladas con arroz y frijoles. Tacos are $1.25 each and come on medium sized tortillas and packed with meat. Two didn’t fill me up but they definitely put a dent in my appetite. The asada is finely chopped and greasy, with the beef broken down to the size of popcorn kernels. 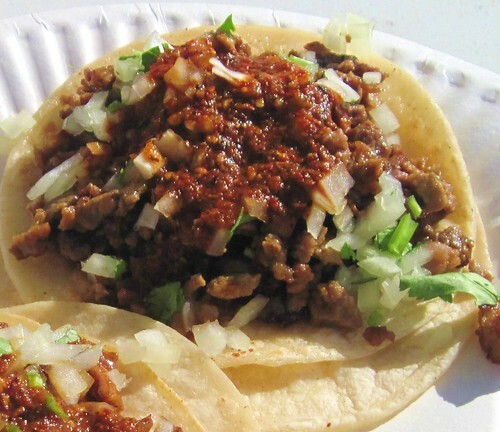 The cut of beef may not be ranchera or a high quality but there is a lot of flavor here and with an excellent spicy chile salsa the taco is classic LA street. The al pastor was the better of the two and tasted like it came from a vertical spit although I didn’t see a spit in the truck. The pork’s salty charred bits were the perfect pairing for the spicy salsa. After eating my tacos I doubled back to San Pedro St and headed towards downtown. If I didn’t have to be somewhere I could have drove around all day looking for tacos . It was one of those days, everyone seemed to have a lazy stroll to their step. The sun had broken through the morning clouds and on my I-pod was Ludwig Van and for a moment I felt like I could get away with it, just leave work behind for a day. But then reality got a hold of me and I remembered their were no taco furloughs written into my contract.